4m @ 18 will give 20ft sets . 6m @18 - 30ft . . But in hawaii the waters deeper & the reefs focus swell better than margarets . Wave size will be bigger due to the bathymetry . Not to mention todos,mavs,cortes,nazare,dungeons ,& more breaks where the bathymetry is more favorable than Margarets for xxl waves . 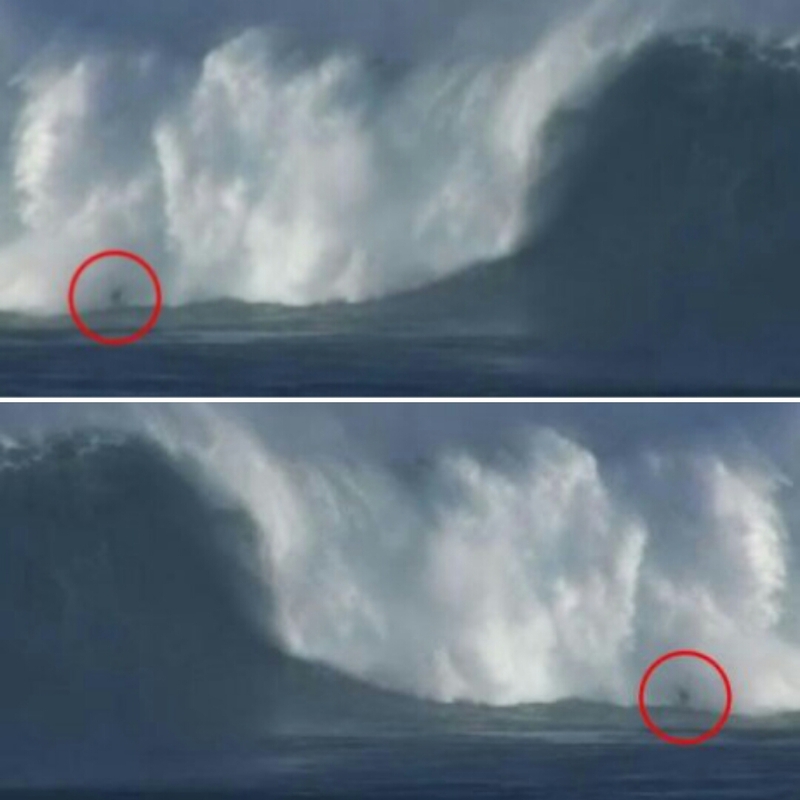 This discussion was inspired by my desire to teach craig ( my friend) & others how big the jaws comp was & because I see it regularly by the swellnet forecasts undercalling xxl swells & friends who look at pictures of big waves & underestimate the size . So the swell at jaws : wasnt it 5m plus @17 ,[email protected] etc ? Immediately that means about 25ft without even adjusting my scale from margs to Hawaii due to bathymetry ! All these swells around the world on average are 4-5-6 m with 16-22 sec periods that produce easily 25ft surf . Totally agree that pix undersize waves. Not that i have ever been in properly big waves ( "man's gotta know his limitations"- dirty harry). It's always irked me that people can't just call a wave for its actual size - ie. face height. Anything else is just fiction, or some esoteric value that calls in various factors including water depth, swell period, ego, testosterone, blah blah. Trying to work out a formula is just nonsense. 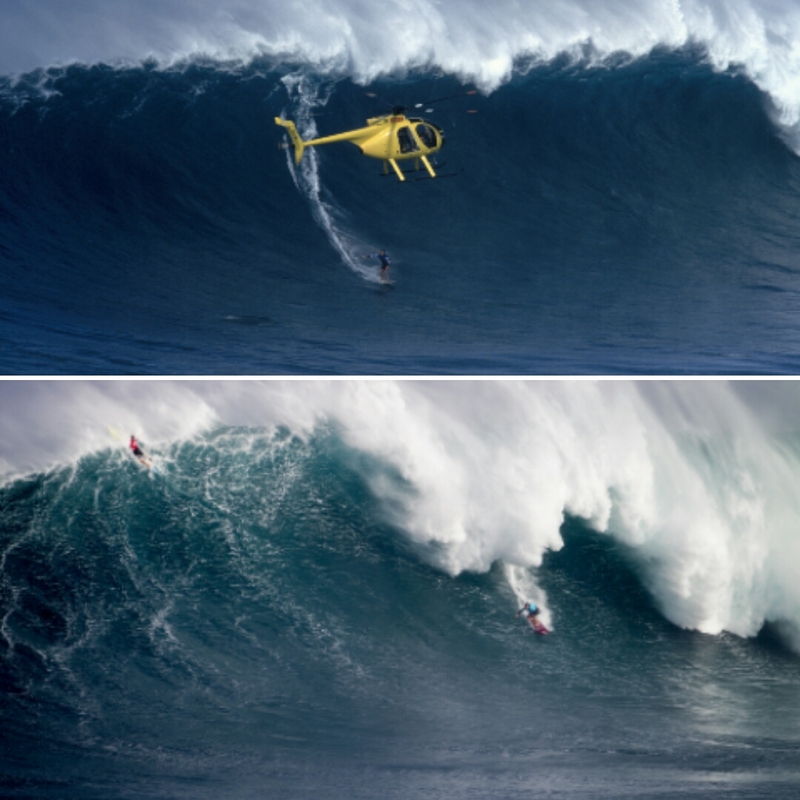 Personally every wave I've ridden has felt smaller than what photos have shown . Mind you cameras don't show often in the parts I like to frequent . With the excpetion of big barrels waves to me always seem smaller when riding them than scratching for the shoulder or getting caught inside . Maybe it's just my vision . I think we are de -sensitised by tow surfing with guys on small boards making it look bigger than guys paddling on massive guns . As for raw swell heights , I've been out of my depth and seriously undergunned a few years ago in 6.3/6.8 M ?!? @ 19 or 21 sec's . And that day I was told by somone older with far more experience including Hawaiin , that it was 15 ft . Admittedly that swell angle didn't concentrate onto the reef , and elsewhere was probably 20ft plus . Crip that is exactly why people should talk swell heights not wave heights . The power involved is calculatable by height by period . How hollow I'd probably the third variable , but that is definitely easily recognisable . The big thing I think that is lacking is swell speed . And probably this is where Camel is heading . Until someone works out a way of accurately measuring the swell hitting a reef then we will have our measurement nirvana . I agree with Crisp. If this thread is about measuring pure wave height then surely it's cut & dry, simply measure the wave face. Southey with all due respect but you've already complicated the thread by introducing other variables. I'm not suggesting that these variables don't necessarily affect wave height (your knowledge seems far superior to mine in this field) but wave height is wave weight, power & hollowness aside. It is what it is. A standard measure in feet is required, from a particular point at the base of the wave to the apposing point at the peak etc. 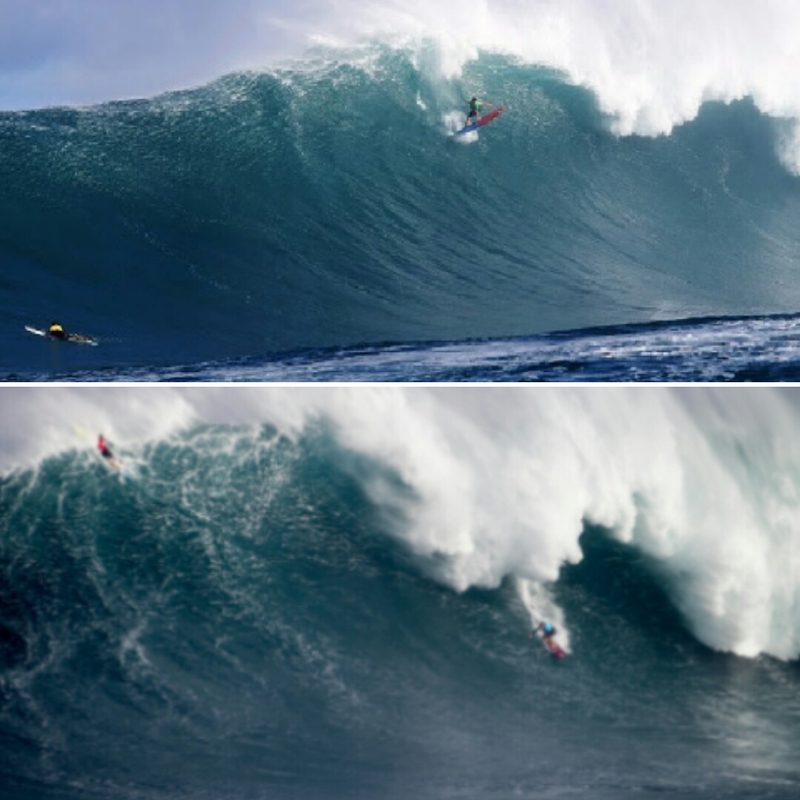 Why not ask the blokes that were charging this recent Hawaiian swell. See how many variable answers we get from these guys (if any) & why. A great topic to discuss for sure. I just think of wave height as a measure of how tall the wave is. That does not define how big and heavy the wave is, except possibly in relation to other days at the same break. We all know that tall does not, as a general rule, perfectly correspond with destructive power for anything. Caml, it seems you want wave feet to be a measure of more than vertical height. You want the wave feet measure to also reflect the mass and the speed of the water. The forceful energy of the wave. I reckon that's fine, but that's not 'feet'. Thanks Cam, totally understand where you are coming from. But while those estimated wave heights you've given for the swell sizes and periods are on the mark, each location and reef etc will deal with the incoming swell differently. Regarding calling the size, everybody has slightly different scales, but I think if you're consistent in you're sizes, people can then align themselves to that and get a true idea of how big it is. I subscribe the commonly used scale of 3ft = head high, 6ft = 2x overhead etc and 20ft = 40ft faces. In line with you and opposite to Southey, I agree with that photos make the wave look smaller than it felt yourself on it, but this might just be mental perception. It's a big can of worms calling wave height, but as I said above, I think the key lies in consistency. Yeah, now I understand what you're getting at Camel. But calling wave height based on swell height & period only works for regions, or maybe deep water offshore reefs. It does not work for individual breaks. So I rock up at Bells and it's a cranking 8-10ft (faces). Double overhead. Craig would be calling it 6ft. Macho men might call it 4ft coz they're heroes. But with that swell, around at Fishos might be 2ft. Barely knee-high. Craig would call it 1ft? But down at Port Campbell, it's BIG. 20ft. 4x overhead. Craig calls it 10ft. Then the swell jumps. Doubles in size. Down there it's now 40-50ft faces. Craig calls it 20-25ft. But others are calling it 15-20. There was a thread on this some time ago, and it seems that it's acceptable to have a sliding scale, where as it gets bigger, the increments in what it's called get smaller. If I get to a break, I want to be able to say that it was x ft. Not have to look up a swell chart to find out what the swell height & period is. As you say Craig, consistency is the key, across regions, breaks and sizes. I agree with pretty much every thing you say there crip, apart from the bit if bells had 8-10ft faces Craig would be calling it 6ft. I don't think he would, or would I. It would be 4-5 ft. You can't call a wave with a 8ft face 6ft. A 6ft wave would have roughly a 10-12ft face. IMO. Not wanting to weigh into the old wave measurement argument but just curious about Caml's call that it was the biggest Jaws ever paddled. Seemed like Doz, Greg Long, Rowley and others had paddled equivalent or bigger waves. And Albee Layer called it a 3/10 on the day....so he obviously didn't rate it as the "day of days". Whats been the call from the guys who surf it all the time? Biggest ever paddled? Or just an awesome day of paddle-in big wave riding? The only thing I have to add is that to get a reasonable idea you must be at water level. Photos taken from any height above the water result in parallax view error and will definitely lead to size being under-called. the great thing about Peahi is all the water craft in the channel, many of them taking photos. A day some time ago, I'm thinking last year or early this year, where Dorian was just carving it up on a virtually windless and big day had some of the best surfing shots you could hope for. But all you have to go on from the pics is the size of the surfer and the board he is riding, which are known, and the height of the wave face, which has to based on the two known factors. Caml, I'm sure the camera does lie, but it would not be distorting the surfers and boards relative to the wave face. that is, both would be distorted by the same factor, so the relativity remains. Only a mad man knows the feeling! Seems like the solution here is units. I can recommend a rock solid unit: The Gary. Gary G wrote: Seems like the solution here is units. The tow vs paddle shows they were paddling bigger waves this event than they used to tow! Caml here is the data. I haven't had a chance to read the thread yet just scanned down. 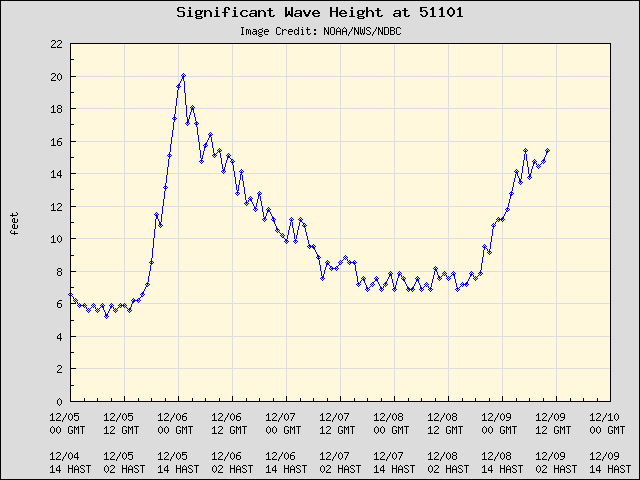 This is the 01 buoy approx 14-15 hours from Maui. Go off the HAST times (bottom). So the peak is 20 feet at 17 secs at 2-3pm dropping fairly quickly. Add travel time and peak was approx 5am with Surfline calling 40 - 60 feet wave faces. Which was inline with the waves caught pre-comp. People who have been there maybe able to put a figure on it. Good luck with wave heights debate, you're opening a can of worms haha. If somebody rides a giant wave and nobody takes a photo of it was it still ridden? That is the question. I like Craigs headheight =3ft and so on. 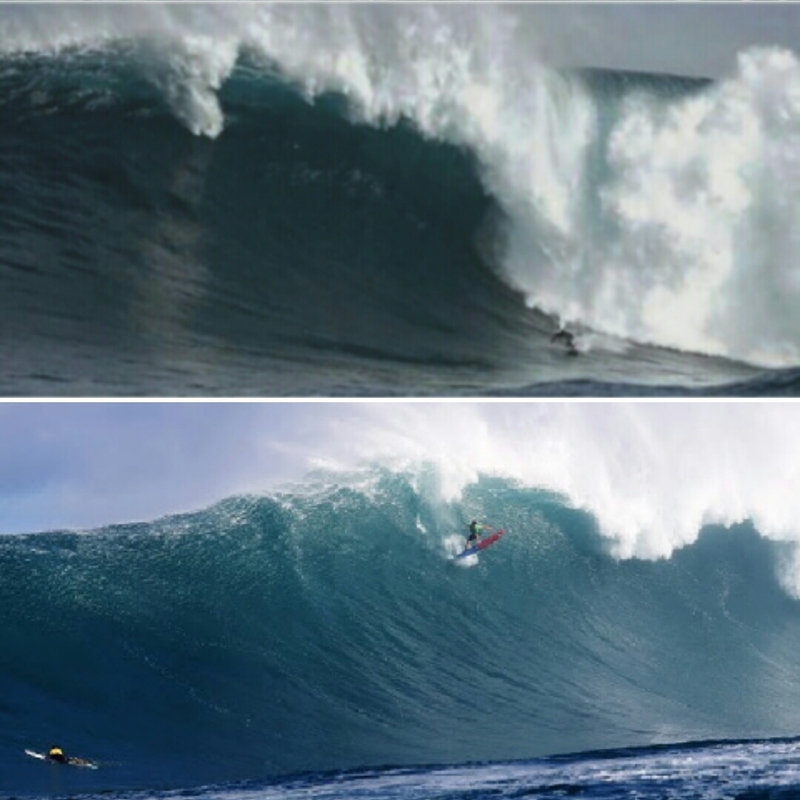 Lots of size difference variations in the angle photo is taken from, look at Jaws pics from the water shots for a truer size angle rather than the cliff same goes for Waimea . Nobody could have paddled Eastoughs Cow wave, not then not now no matter how great they paddle, how many lifejackets they wear or how much money is up for grabs. Jaws has a more surfable/rideable face shape at that size than CB, same with all the waves in Hawaii compared to WA, totally different ocean floor shape, hawaii is just mountains sticking up out of the ocean so the revines become the channnels, WA is deep coming into chunks of shallow , less perfect (in many ways). Camel, using raw buoy data to estimate surf size is fraught with difficulties. Across the southern Australian states, large swell events are often heavily contaminated with local windswell - so the standard metrics of Hsig, Hmax and Tsig or Tz won't reflect the true value of groundswell in the water. Additionally, the WA buoy data is proceesed in a slightly unconventional manner, to produce a non-standard output (they do this by truncating the spectral data at 11 seconds to produce 'swell waves' and 'sea waves'). I've spoken with Dept Transport about this problem many times over the last ten years, but it's out of their control (the processing is done by ocean/met software company Tremafon). Therefore, when using your formula for Cape Naturaliste and Cow Bommie against Cape du Couedic and Yanerbie, you're not really comparing apples with apples. 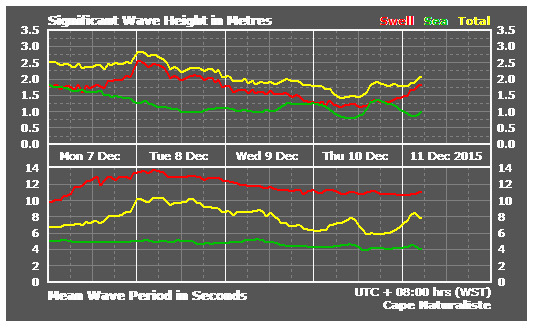 Yeah that is about right Cam, here's both the swell height and period together.. I'd agree with 25ft bomb sets, but most waves being in the 15-20ft range. What is "Dominant" period? I'm assuming it's average period but why use the word dominant? Unless its the dominant directions average period? Dominant Period is the same as Peak Period. And the peak was around 6pm the evening before at this buoy, 51101, which is some 500km from the North Shore (approx 10hr travel time) and 690km from Maui (approx 13hr travel time). Each little notch is 4 hours, so 12 hours between each label on the bottom axis. HAST is Hawaii time, ie 14 HAST is 2pm Hawaii Time. I also believe photos can make the surf look smaller than it was / is and this can be for a number of reasons. The angle, especially if taken from the same plane as the wave , often won't show how much of a trough has been made by the wave drawing the water off the reef/bank. Also quite often the surfer turns 2/3 of the way down to the bottom of the wave rather than running all the way to the flats which can also make the wave look smaller. Photos can also fore-shorten the image which can also distort the size ratio of the wave and surfer. The biggest I've ever had the courage to surf was what the Hawaiians were calling 8-10ft but I would have called 15-20ft and was happy to make it in in one piece. There was so much water moving around, peaks shifting , cleanup sets etc and certainly looked and seemed at lot bigger in person than it did on any photos I saw of the day. But of course this could also be our own perception and fear coming into play, though, you often hear people remark how it seemed bigger than the photos of most peoples larger surf sessions. I'd love to be out there one day in a safe place and watch something as big as Jaws break but be stuffed if I'd have the fitness, skill and guts to take that stuff on!! Sure, they're not the only buoys that get contamination. But it needs to be taken into consideration. 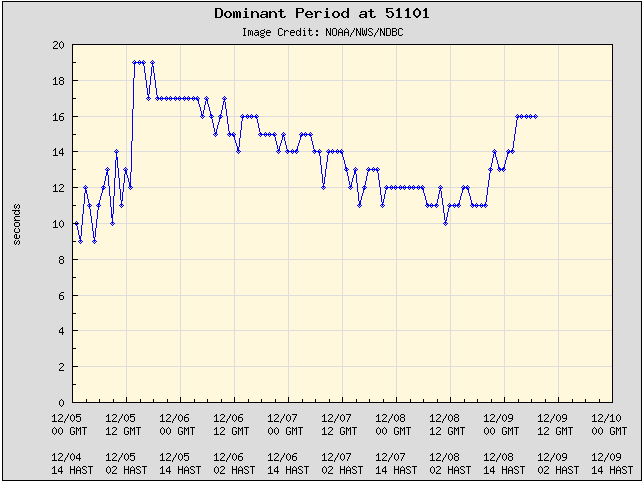 Re: WA buoys - they don't display time series graphs of Tp and Tsig, or Hsig. Most forecast techniques involve calibrating model predictions against recorded observations. But the models don't forecast "swell height" and "sea height" - they forecast either individual swell trains, or significant wave heights. 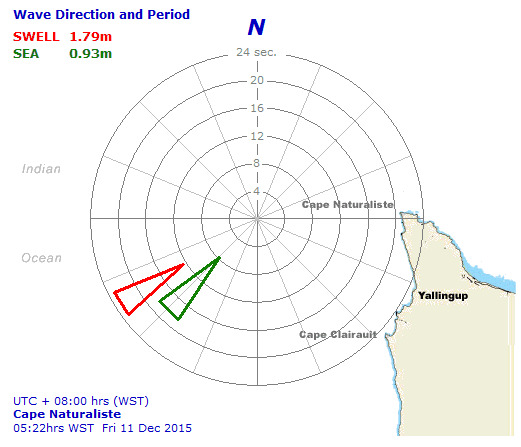 So in WA there's no way to know if the swell is higher or lower that forecast expectations. My main gripe with the WA buoys is the lack of graphed Tp though. The CdC, Sorell and Nepean buoys will often record Tp of 20+ seconds, yet I've never seen any WA buoys higher than about 16 seconds (for their "swell period"). Again, this is another calibration technique to assess just how high core wind speeds were. If Tp comes in earlier and higher than modeled, then you know core wind speeds were stronger and you can recalibrate your forecast based on this information. Know whatcha mean G-love, nothing like getting the ruler out! Gents, given the multitude of variables in swell height and buoy locations, contamination, local environment factors, can't there be an agreed measurement method at the location it breaks ? So if camera shots are taken at angles, it should not be too hard to work out any parallax errors and thus correct. The lip is relatively well defined whereas the base would need to be defined. But I must admit, I do like the 'hawaiian' height - generally conservative ? Nice piece of work braudulio. Just so we're on the same page, what data are you looking at on the WA buoys? Using today's data (below), what numbers are you referencing? Thermalben: I don't understand all the technical stuff you were saying, but that WA swell buoy is generally pretty adequate for me. Today's data tells me at one of the waves I regularly surf it will be 4-5 with the very very odd 6 footer. At another joint it will be 3-4. It's knowledge of what that data translates to at particular waves that Camel is talking about I believe. And, referring to an earlier post, the buoys do go above 18. Some of the bigger waves we get consistently are driven by ramps in swell period and not necessarily swell height. I'm talking 6-10 rather than huge swells so 2-2.5 but with 18-20sec periods. That happens reasonably regularly over Autumn/winter. I also agree with Camel that blokes in the southwest start getting nervous about calling anything over 12 foot. At my local Bombie it will three times over head (I am 6'2") and the boys will be calling it four foot. How does that work? And the data I was referring too was the slightly updated version I looked at about five minutes before my reply. I was annoyed I couldn't surf.